In the wake of the leaked Panama Papers that show that several politicians and other prominent persons have stashed monies overseas, Guyana’s former President Bharrat Jagdeo said Thursday that he has not hidden any of his wealth there or any other tax havens. “The answer is ‘No’ or anywhere,” he told a news conference. The leak of millions of files from the Panama-based law firm, Mossack Fonseca, has revealed that that company has allegedly helped clients launder money, dodge sanctions and evade tax. Jagdeo also publicly called on the Guyana government to agree to approach International Police (InterPol) or any major international private investigation firm to probe whether politicians in and out of government have put some of their wealth in foreign tax havens or other interests. “I am prepared now to still cooperate with the government, not surreptitiously through SARU (State Asset Recovery Unit),” he said. 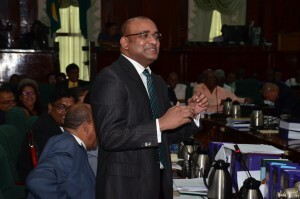 Now the Opposition Leader, Jagdeo recalled telling Prime Minister Moses Nagamootoo in the corridors of Parliament Building that the opposition and government should agree in the National Assembly to ask international investigators to report on all parliamentarians who have foreign bank accounts, shares in companies and properties. He reasoned that if the National Assembly approves a motion to that effect, the International Community would not regard it as partisan. He recalled that the People’s Progressive Party Civic (PPPC) had taken a now defeated motion to the National Assembly for parliamentarians’ files to the Integrity Commission to be released. Jagdeo questioned whether the coalition-led administration would be willing to support the PPPC’s proposal to hire an investigator to conduct the probe about past and current presidents and parliamentarians. The British Broadcasting Corporation (BBC) reports that there are links to 12 current or former heads of state and government in the data, including dictators accused of looting their own countries. More than 60 relatives and associates of heads of state and other politicians are also implicated. The files also reveal a suspected billion-dollar money laundering ring involving close associates of Russia’s President, Vladimir Putin. Also mentioned are the brother-in-law of China’s President Xi Jinping; Ukraine President Petro Poroshenko; Argentina President Mauricio Macri; the late father of UK Prime Minister David Cameron and three of the four children of Pakistan’s Prime Minister Nawaz Sharif. The documents show that Iceland’s Prime Minister, Sigmundur Gunnlaugsson, had an undeclared interest linked to his wife’s wealth. He has now resigned. The scandal also touches football’s world governing body, Fifa. Part of the documents suggest that a key member of Fifa’s ethics committee, Uruguayan lawyer Juan Pedro Damiani, and his firm provided legal assistance for at least seven offshore companies linked to a former Fifa vice-president arrested last May as part of the US inquiry into football corruption. The leak has also revealed that more than 500 banks, including their subsidiaries and branches, registered nearly 15,600 shell companies with Mossack Fonseca. Lenders have denied allegations that they are helping clients to avoid tax by using complicated offshore arrangements.